Now that we have got to the good weather we have been spending more and more time outside. While we where out in the garden one afternoon a few weeks ago D asked could he paint. We got everything out and D set to work making a lovely picture, in the process he spilt 2 tubs of paint over and painting the ground a lovely shade of brown. Painting outside is messy and even though he was using poster paint it ended up taking forever to wash away, every time I added water it made the paint run in all directions. After that I just said no and gave D some chalk to draw on the ground. The only problem was he didn't want to draw. 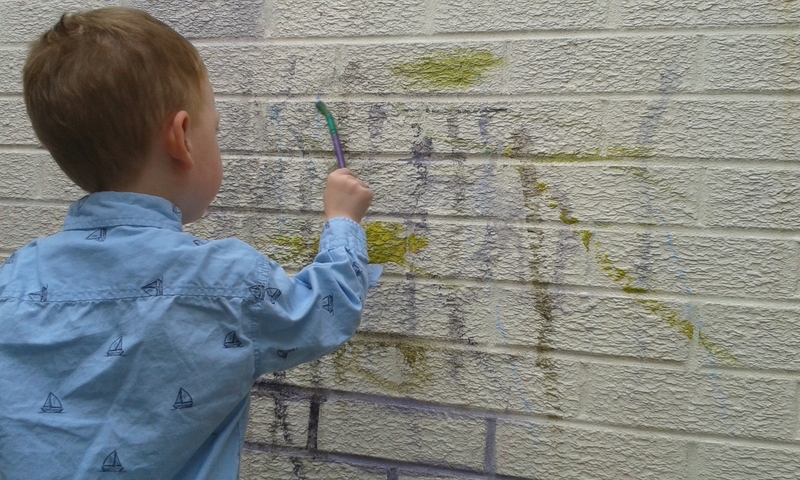 He wanted to use his paint brush and paint on the ground and walls outside. I remember that during school we had used chalk and made it more like paint by adding water to the brush before rubbing on the chalk. It had got me thinking about making chalk paint and after a bit of talking myself into it we gave it a go. I don't know why but I was convinced it wouldn't work. I knew We would need water and various colours of chalk, I also knew that simply adding a full piece of chalk to some water wouldn't work. That would simply make slimy chalk that was no good for anything. So I thought the best way to figure it out was to go back to the basics of paint. Paint is a powder that water or another liquid is added to in order to create the runny texture. The first step in creating our chalk paint was to find some chalk. I had come across this bright and colourful chalk while out doing our weekly shop and as D has a chalkboard in his room I thought the bright colours would look fab on his board. The small set contains 6 different colours which are all very bright and vibrant. 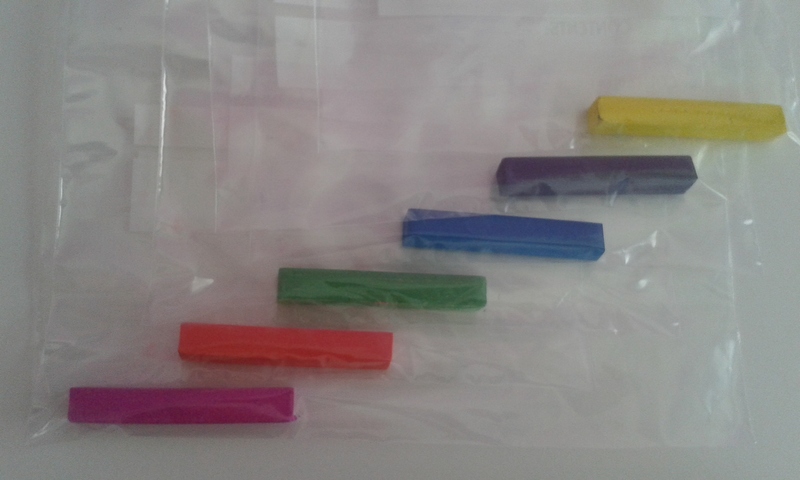 Although the set only has 6 colours the sticks are each thick and a good size. Our chalk came from Poundland. After we had the chalk we needed a way to break each chalk up without mixing the colours or ending up with chalk powder everywhere. 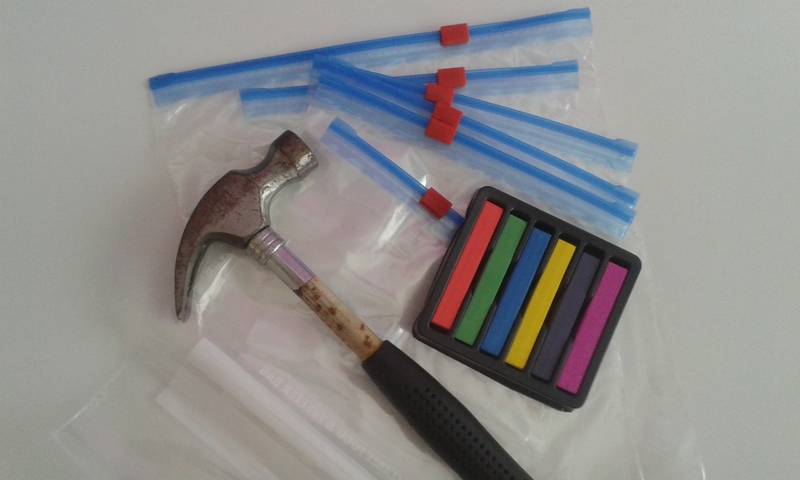 However it couldn't be a box or bowl as I needed to use the hammer to break it up so in the end I got some freezer bags which had a zip close and I placed one piece of chalk inside each bag. The easiest and fastest way to create a powder from a solid is for us is to smash it with a hammer or a rolling-pin (if your children want to get involved). D loves hitting the chalk with the rolling pin and has asked to watch me breaking up the last pieces with the hammer. He will sometimes shout "faster, faster mummy!" We usually smash each piece individually on a mat beside the back door. You can see all our colours in the above picture. 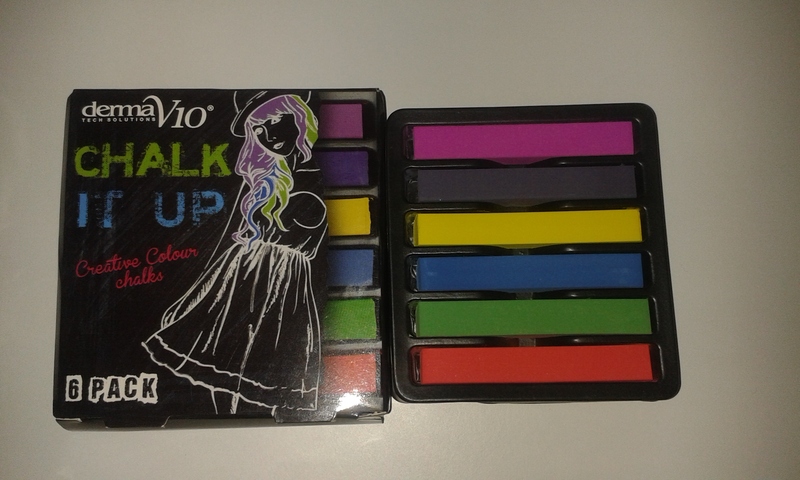 Once you have all your chalk powder gathered together you need to decide what you would like to do. If you are just creating some pictures on card or paper then I recommend using about a teaspoon full of powder for each paint or if you are doing a larger area or painting outside I would recommend using a about half /full stick of chalk in powder form. Add the amount you need into your plastic cups like above. To turn the chalk powder into paint you need to add water. 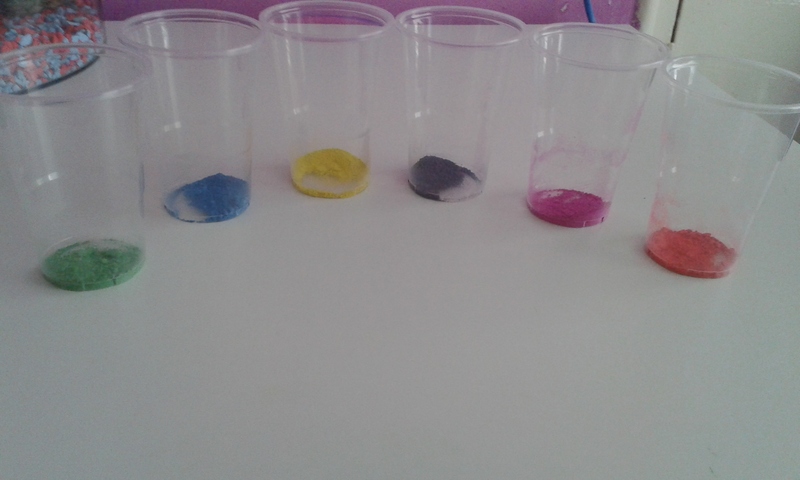 You can see D above mixing the water and chalk powder to make the paint with his paint brush. It's really that simple he can do it himself! You will need to be very aware of how much your adding for some projects and not so much for others. The first time we tried making chalk paint I added way too much water and we ended up needing to empty some out. When painting the pictures on paper/ card I added around a teaspoon of water to start and slowly added a little bit more until I had the right consistency. Creating paint for the walls and ground outside was much more of a guessing game and I would usually add too much or too little water. We figured out that after about 10 minutes the water and wet chalk particles start to separate which is actually perfect if you add too much water! You can just wait for the chalk to separate and pour out some water being careful not to pour out any chalk particles. Alternatively you could simply dip a piece of kitchen roll (Kitchen towel/ paper) into the watery layer on top and allow it to absorb some of the water. 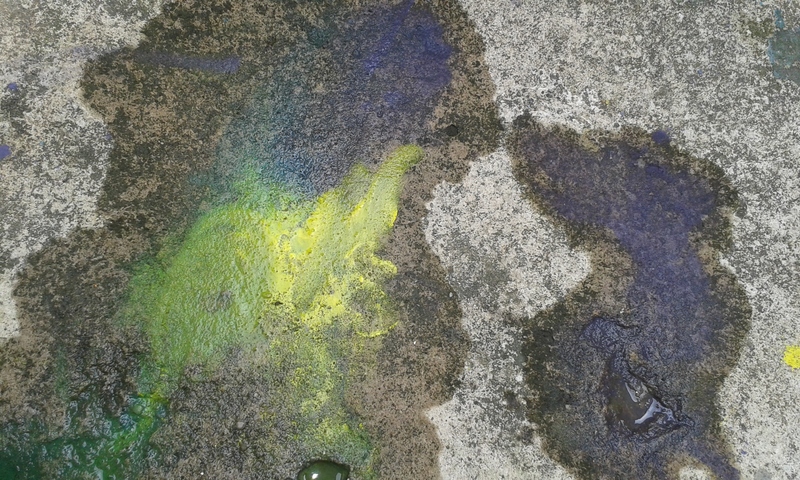 We also found out that spilling some of the paint on the ground outside can help the separation process happen quicker. When the ground starts to absorb the water it will spread to a wider area and keep the paint/ chalk particles in the same place. Explaining how and why the ground needs to absorb the water in the paint can be a good way to add some learning into the painting session too. You can clearly see the water spreading out in the above picture while the paint stays in the same area as when it was poured. This paint will be much thicker than the paint in the cup. Chalk paint is very versatile and can be used to learn about both layering and mixing colours. 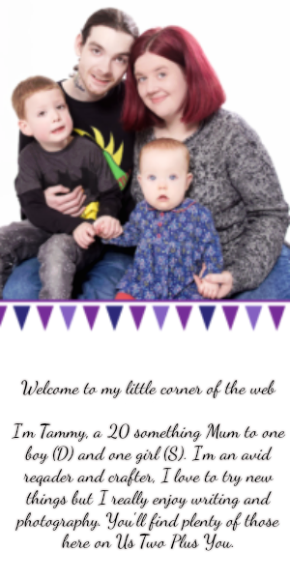 You can see in the pictures we made how you can mix the colours together even after they are on the page and in most instances you can also mix them after they have dried! Not only can you mix the colours but layering them over each other with actually removing either colour is also very easy by letting the bottom colour dry slightly before adding the second colour, it does help if you don't run the brush over the area too many times too. You can see both the mixing and layering in our pictures above. The first time we made chalk paint was for in the garden and we got on very well. D really enjoyed being able to paint on the wall and the ground. He loved creating his master pieces and he really liked that even after t first rained his picture was still there! This would be the perfect paint to use for creating a hop scotch board or other similar games that your kids like playing. Our back garden is just wall after wall of white. 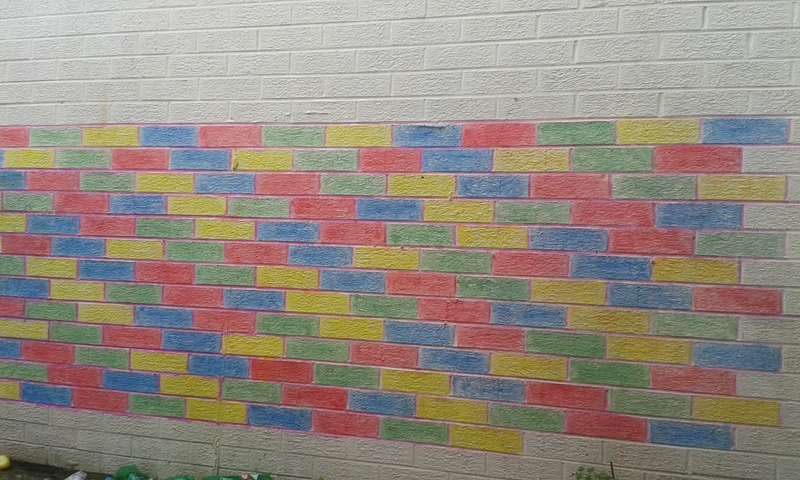 There's no real break and seeing D painting all those bright colours gave me an idea on how I could brighten up the garden without actually having to get all the outdoor painting equipment out and to be able to change the whole wall by simply washing away the chalk paint. I spent the time we where out with D everyday in the garden painting the rectangles from the bricks on the longest wall in the garden. I used five of the chalk colours and alternated between four of the colours and I used the fifth to colour all the motor joints between the bricks, creating a kind of framework. We have all loved spending time together painting all kinds of pictures. I love how versatile the chalk paint is and when we are finished we can let the leftover paint dry in the plastic cups before stacking them up. This way they are pretty much ready to go next time we want to paint, I can just add water to the chalk and maybe some more chalk powder if it needs topped up. D is ready to go out and paint a picture or even just to paint a picture at the table on his paper/card. Chalk painting can be the perfect activity for those summer days spent outside in the garden and can very enjoyable for both adults and children to do together. What do you like to do in the garden on sunny days? You can find all of our other summer related posts by clicking on the badge below. Thanks for this idea. 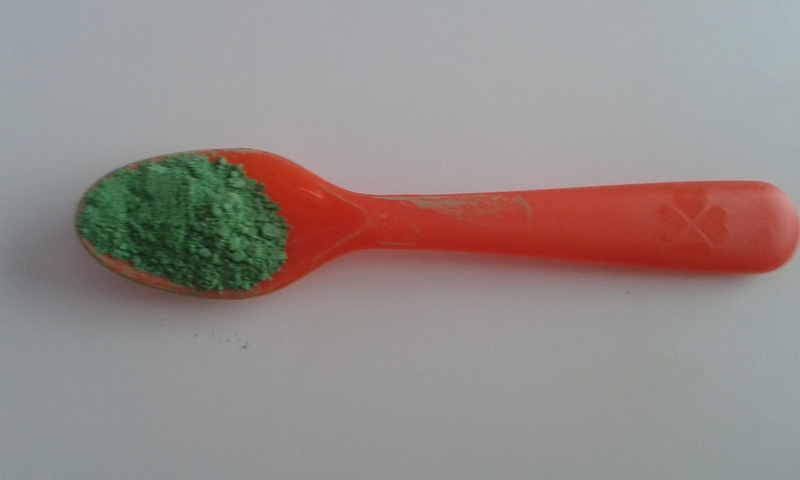 We always seem to have broken bits of coloured chalk that are too small for my granddaughter to draw with, so now I will use them to make paint for her.